In a large bowl or stand mixer, beat together frosting, whipped topping and pudding mix until light and fluffy. Transfer mixture into two large icing bags. Seal and freeze overnight. When ready to serve, snip a corner from the icing bag. Pipe into shot glasses. Top with whipped topping, rainbow jimmies, and a maraschino cherry. Enjoy! A quick, delicious way to make homemade soft serve ice cream! If the merry jingle of the ice cream truck has been driving around your neighborhood but you never have cash, we’ve got a cool way to get your ice cream fix—quick! Sweet, homemade soft serve, made with frosting. No churn. No machine needed. Just creamy, fluffy, sweet ice cream, swirled into shot glasses and served with a little wooden spoon. Summertime just got sweeter than ever. Here’s your line-up: a jar of Betty Crocker™ frosting, a big tub of whipped topping, and instant pudding mix. I went for banana because the mere thought of mini Banana Split Ice Cream Shots sent me over the moon. Pop everything into your stand mixer and whip until light and fluffy. Like, super super fluffy. Add a smidgen of Betty Crocker™ yellow gel food coloring to create some golden wow. Now spoon it all into an icing bag and freeze overnight. When you’re ready for the sweetest, fluffiest soft serve ever, simply snip a corner from the icing bag and pipe into the little shot glasses. How in love with frosting ice cream are you? Look at those perfect swirls of frosty yumyum! Finish it all off with a swirl of whipped topping (I piped mine through a large star tip). Pop a cherry on top with a little sprinkling of rainbow jimmies and grab a teensy spoon. 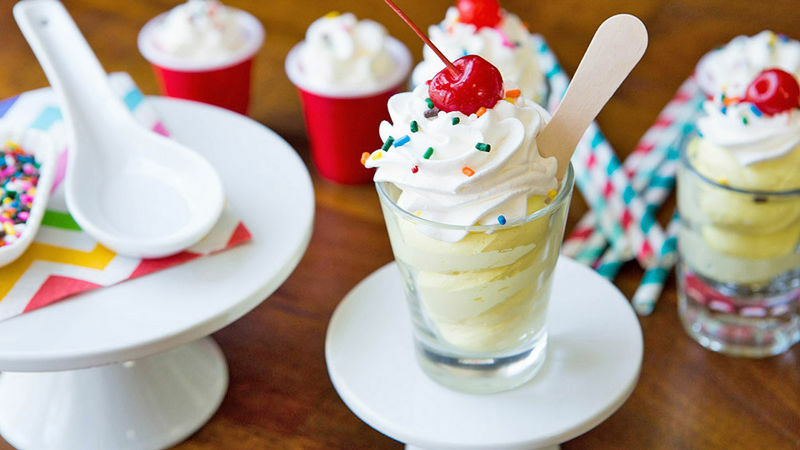 These frosting shots are ready for your face!